A box of toys from the fourth dimension. Created by mtb design works, Inc.
What if you received a box filled with mysterious toys from a fourth spatial dimension? Playfully explore and marvel at beautiful shapes powered by a groundbreaking 4D+time physics system. Poke, throw, roll and watch as they disappear into a dimension you can't see. Become a child of the fourth dimension. In this case the 4th dimension is not time but a 4th dimension of space that works just like the first three dimensions we are familiar with. If you count time these toys are 5D. 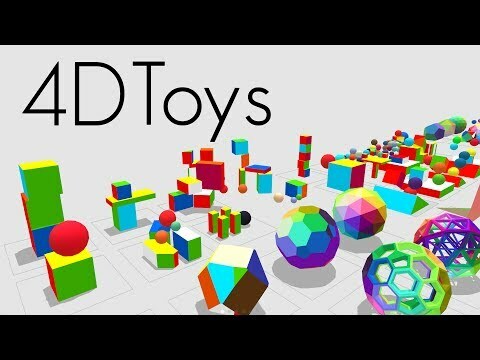 4D Toys was added by Czlon in Jan 2019 and the latest update was made in Jan 2019. The list of alternatives was updated Jan 2019 There is a history of all activites on 4D Toys in our Activity Log. It's possible to update the information on 4D Toys or report it as discontinued, duplicated or spam. We want more alternatives to 4D Toys. Feel free to add any alternative that you know of, or ask your friends on Twitter or Facebook if they can help out. Alternatives to 4D Toys for Windows, Mac, Linux, iPhone, iPad and more. Filter by license to discover only free or Open Source alternatives. This list contains a total of apps similar to 4D Toys. No reviews yet for 4D Toys, want to be first? Maybe you want to be the first to submit a comment about 4D Toys? Just click the button up to your right!